In round 2 Zen19 played pachi2. They started with a standard joseki in the upper left corner, as shown to the right; but pachi2 played move 15 as shown, which I believe is a blunder. 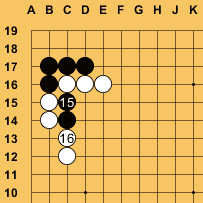 After Zen19 made the natural answer at 16, the two black stones are almost dead. Also in round 2, NiceGo19N failed to clean up against MCark, but won the game anyway even with MCark's dead stones counted as alive. In round 3, AyaMC played move 189 as shown to the right, against pachi2. Admittedly, it was far enough behind that it had very little chance of winning. But this move is worth one point in gote, there are many bigger moves. In round 6 stv failed to clean up against MCark, but won the game anyway even with MCark's dead stones counted as alive. In round 7 MCark ran out of time in the clean-up phase, in a lost position against stv. MCArk was not present on the server in round 8, and lost on time against Orego12. 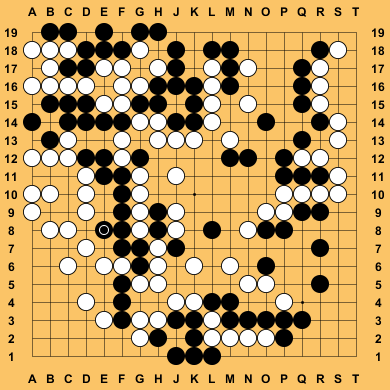 MCark was connected again in time for the start of round 9, and played its game with NiceGo19N. In round 12 Zen19 and pachi2 played for a third time. Pachi2 had won their first two games, but Zen19 won this one, rather easily, or so it seemed. Steenvreter, running 46 threads each at 2.2 GHz, on a system whose use was generously provided by the Maastricht games and AI group.